Think! Leadership - Seeing The Bigger Picture. We are all aware how quickly the world around us is changing. Whether it be professionally or in our personal lives, keeping up with constant change is both daunting and exhilarating. The major shift that we are seeing now is that leaders are required to be far more than exceptional technicians, they are also required to be conceptual and creative and to drive the thought processes that are needed for success and sustainability. The problem is that we teach people to be exceptional technicians, but rarely do we teach people how to THINK better. What the future is demanding is thought leaders – people who know how to both create and execute ideas. The exciting thing is that we can all do this, no matter what our background, but we must first understand what thought leadership means. If we wanted to exercise more, or do more with our family, then we would have to make the time to do so. Thinking is the same. Although many of our thoughts happen on the run and many of our thoughts come from the knowledge and patterns we have developed over time, new thoughts usually only come to us when we make the time to think. Just like any other habit or discipline, thinking time must also be seen as an important activity and be scheduled into our day. Nothing can fully develop until we acknowledge its importance to our growth and survival, then we treat it accordingly. So, before we can master the art of thinking better, we need to commit to the idea and declare ways that we will introduce thinking time into our daily lives. So think about it, how can you make space in your busy day to stretch your thinking, because unless we do, we continue to think and act the way we always have and that just does not work in this fast-paced time in history? 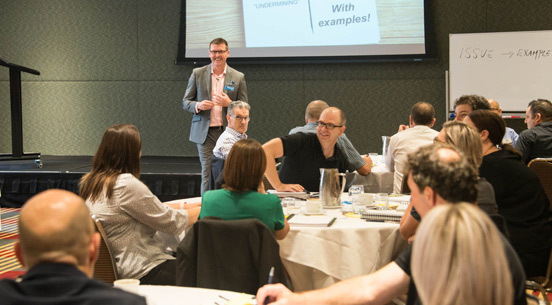 Richard Dore and Nathan Browne conducting the Leadership By Design program at the RACV Club in Melbourne. Approximately 30 participants from a diverse range of industries participated in this exciting program. Check our website for the next scheduled program in your area. Don’t miss the opportunity to reward your team by taking them to one of our Super Breakfasts scheduled across the country. Des Penny - CEO and Richard Dore – MD, facilitate these very popular breakfasts. Take a look at when the breakfast is coming to your area. Creating Great Leaders At Proteus Leadership! As an Leadership and Management Training company it is important that we practice what we preach, both in the education and professional development of our own staff, and in developing the product knowledge and facilitation skills of our program facilitators. During January and February our teams from right across Australia attended internal training programs to assist in all of these areas. In conjunction with our internal programs, all of our team members get the opportunity to attend and participate in our scheduled workshops, seminars and breakfasts so that they can also meet and network with our clients. It is important to us that our team is all on board with the Proteus vision and that we give them as much opportunity as possible to grow. 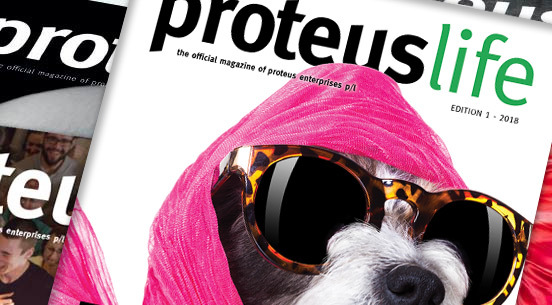 Every four months Proteus releases a new version of its leadership magazine – Proteuslife. 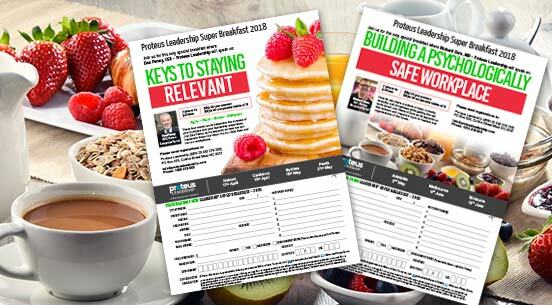 If you don’t currently receive a hard copy of Proteus Life, follow the link below to sign up and receive your free copy. You can also access the magazine electronically through our website or our Proteuslife App. 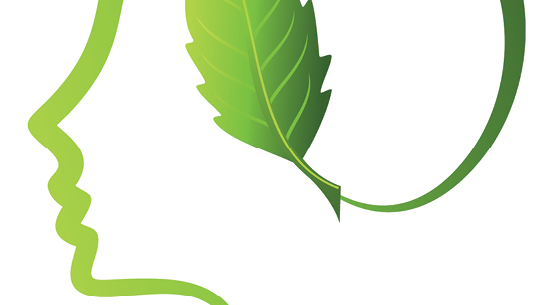 Proteuslife – keeping you in touch with what is happening in the leadership space. ”The Think! Leadership program was enlightening. I found the program stimulating, even as I sat in the sessions I was coming up with ideas of how I could do things differently in my workplace. The concepts aren't complex, in fact, sometimes they seem too simple to be true but once explained you see their usefulness and the tools provided makes implementing them easy. I'm excited to see how having a 'big picture' perspective changes my role and the way I work." 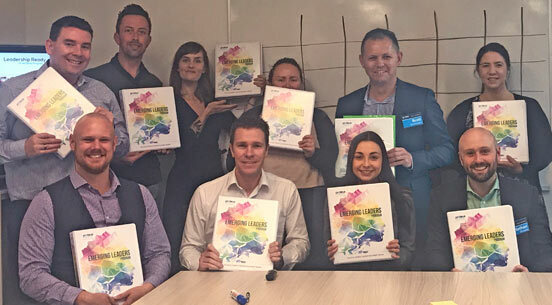 "I really enjoyed the Think Leadership Program, it had the right balance of interaction and 'lecture' type material (although it wasn't really lecturing which was great). Presenters were great and their styles were fantastic, this is what really made it interesting and engaging. The concepts were new and presented in a way that were translatable to work." "I found the face to face component of the program very informative and thought provoking. I left both days feeling inspired by what skills I currently have that I could improve on as well as new ones I could adopt into my everyday practice as a leader." "The program presenters personalised this experience for each of the participants and due to this fact, the program became an experience which was both confronting and relevant to the situation most of us currently find ourselves faced with. I took so much away from the experience which I believe will contribute to the further enrichment of my leadership skills and allow me to become more strategic in building succession planning within my current workplace."